London-based aesthetic medicine physician Dr Barbara Kubicka has a reputation for creating unique and innovative skin treatments; offering her patients the latest technology and unique approaches to difficult treatment areas. Now Dr Kubicka is tackling a new area and a skin problem that affects some 80% of the population at some point – acne. Dr Barbara Kubicka is one of the first skin doctors in the UK to offer the Lustre Pure Light Acne Treatment device by Ambicare, which has already been nominated for an award. Lustre Pure Light Acne Treatment is a medically supervised light-based therapy system which patients use at home. Scientists have found that visible blue light at a wavelength of 420 nm does not cause damage to the skin but is effective in killing the bacteria which causes acne, so that the skin is able to heal. Patients with acne or spots know that their skin improves after exposure to the sun. However, sunlight also contains ultraviolet (UVA-UVB) light which can damage skin and even cause skin cancer. In addition, finding time to expose your skin to the sun daily and year round is almost impossible. The Lustre Pure Light technology harnesses the safe, natural blue part of the light spectrum to eliminate spot-causing bacteria, while also being gentle on skin and avoiding harmful UV rays. Acne Light Treatment can be used alone or alongside regular professional exfoliation such as chemical peels, or else skin-improving treatments such as Dermaroller micro-needling. It can also be used in conjunction with medication if necessary. This is a medically supervised system and is now available at Dr Barbara Kubicka’s clinic in Belgravia, London. Acne sufferers know the difficulty of treating the characteristic red skin with blemishes and boils. Washing is important to keep the oiliness at bay, but seems to do little to really alleviate the problem; in fact, acne can actually be irritated by products containing harsh chemicals and perfumes. In severe cases, medication such as antibiotics can be used, but there are side-effects and the bacteria in the skin can become resistant to antibiotics too. What’s more, acne can leave severe scarring which will last a lifetime, so finding a solution to treat the problem is highly desirable for those affected. Dr Barbara Kubicka’s success is based on a unique blend of medical skill, knowledge and expertise; combined with a fine appreciation of facial aesthetics and a desire to help people to improve their appearances in a naturally beautiful way without surgery. Her many years experience and ability to listen to her patients mean that she has exceptional understanding of what patients really want and is keen to develop custom-made solutions to their problems. Her exclusive “Eyedealise” treatment was specifically designed to rejuvenate the delicate eye area, while the exclusive “Neck and Jaw-line Programme” is self-explanatory. She also works closely with leading manufacturers and speaks at industry conferences. Dr Kubicka completed medical qualifications at Warsaw Medical, before completing a 2-year post-graduate course in Aesthetic Medicine at the world-renowned College de International de Medicine Esthetique in Paris. She practiced Aesthetic Medicine for a number of years, including a successful practice within Harrods, before opening her own clinic in the heart of Belgravia. 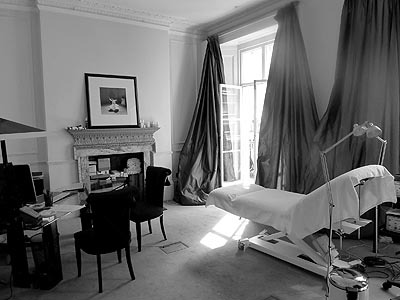 Dr Kubicka’s clinic is based at 9a Halkin Street, Belgravia, London and offers a wide range of cosmetic treatments, including anti-wrinkle injections, fillers, peels, mesotherapy and Dermaroller. Dr Barbara Kubicka also offers treatment for medical conditions such as Hyperhidrosis, Hyperpigmentation and thread veins. For a confidential consultation with Dr Kubicka, call 0207 352 6803 or see the website for further information and contact details http://www.drbarbarakubicka.co.uk.